The Japanese yen was soft today after the Bank of Japan performed a monetary policy meeting and revised its economic projections. The losses were not particularly big, though. As was widely expected, the BoJ left its monetary policy unchanged, with the main interest rate staying at -0.1%. As for economic projections, the central bank cut its growth forecast for the fiscal year of 2018 to 0.9%-1.0% from the October’s estimate of 1.3%-1.5%. The inflation forecast got a negative revision to 0.8%-0.9% from October’s 0.9%-1.0%. While growth forecast for the next two years was upgraded, inflation expectations were cut as well. As for macroeconomic data, the trade deficit shrank from ¥0.48 trillion in November to ¥0.18 trillion in December versus the forecast gap of ¥0.29 trillion. Indices for all industry activity fell 0.3% in November after rising 2.1% in October, in line with expectations. 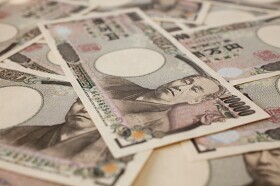 USD/JPY gained from 109.36 to 109.62 as of 9:27 GMT today. EUR/JPY advanced from 124.24 to 124.57. GBP/JPY rose from 141.65 to 142.39.